It is easy to see the beauty that expertly crafted decorative concrete adds to your property. There are so many choices in materials, designs, and finishes available today, that you never need to sacrifice style for the durability of concrete surfaces. Did you know that once you have decorative concrete in place at your home or business, you will experience a shift in property values? That’s right, while specific numbers vary, experts report that installing any type of decorative concrete will add between 5-15% to your property value. Your exact number will depend on markets and other specifics, but even a moderate amount of 10% adds up to a significant sum of money in your pocket. Another way that decorative concrete alters your home or business’s value is the ever-important feature, curb appeal. Real estate is a fiercely competitive market, and details can easily influence buyers. The challenge is to stand out in a way that is tasteful and still eye-catching. By adding decorative concrete, you give your home a competitive edge on other properties. 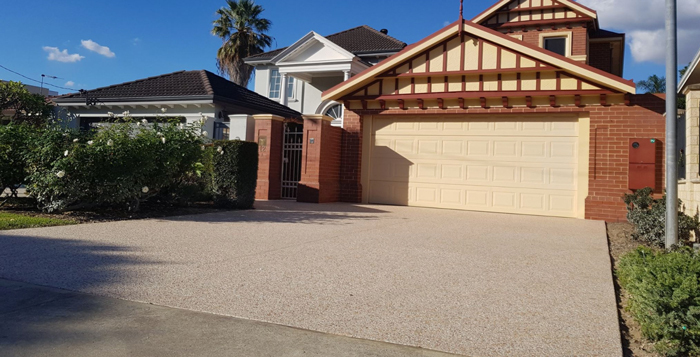 Driveways and alfresco spaces are the two areas where decorative concrete makes the highest impact on potential buyers. A perfectly finished drive is hard for any house hunter to resist. Add to that a beautifully designed decorative concrete patio, and you may have buyers competing for your property. Use of decorative concrete is not just for outdoor areas, so it stands to reason that it also adds value inside your home or business. A strong and durable concrete floor with a gorgeous decorative finish is something you will enjoy every day for many years to come. You will also likely appreciate the time and money that you save on cleaning and maintaining your decorative concrete floor. This flooring is the perfect mixture of style and substance, making it an excellent investment. Installing decorative concrete is a cost-effective and efficient to improve your surroundings. As you can see, it is also a smart way to add extra value to your property too.